A: Is my brain melting? The former was reconciled with a good night’s rest. However, I had become addicted to what the second question had in store for me. That voice belonged to 1/2 of the brother/sister duo (The Knife) known as Dreijer Andersson…that’s the sister for those of you who aren’t familiar with those crazy Swiss names that get slapped on to their young. Since that evening I found out two things: The Knife is currently on hiatus (sad), and that Dreijer planned on releasing a solo effort under the title of Fever Ray. Well, Fever Ray finally gets a proper physical release this week (it’s been available online since January.) So, what happens when Dreijer is let loose on her own? The album opens up with the possibly alienating “If I Had A Heart.” Well seasoned fans of The Knife will easily be able to accept this song, because it’s as minimalist and creepy-voiced as some of The Knife’s more familiar tracks. But I speak through experience when I say that those new to this type of music will easily be turned off already. Well, to be honest with you, the whole style of the album is best described as minimalist. Tracks like “Keep The Streets Empty for Me” and “Concrete Walls” are prime examples of the this. But, they work well to keep the mood intact. That said, there are some great musical tracks on here, that flex Dreijer’s voice and show that she plays her equal part in some of The Knife’s great song structure. “Dry and Dusty,” “I’m Not Done,” and the album’s closer “Coconut” showcase Dreijer’s talent. And that’s pretty much the point of a solo album right? The truth is, this album is best compared to another great solo project, Thom Yorke’s The Eraser. Both albums let the artist stretch their legs out a bit. But, what they ultimately end up as are sort of snacks between meals. Since the release of Radiohead’s In Rainbows how often have I gone back to The Eraser? And that’s how I feel about Fever Ray. It’s doing a great job in filling that gap that time has made since The Knife’s superb 2006 cut Silent Shout. But, when that next serving of The Knife comes around, I see myself slipping Fever Ray into a label-less tupperware, and pushing it to the back of the fridge. Did “Watchmen” Rip Off “TMNT”? Morrissey opens up his latest solo album, Years of Refusal, with a strangely optimistic start. However, optimistic isn’t really the correct word to describe anything Morrissey related, is it? Also, that song (“Something is Squeezing My Skull”) is about being unable to feel alive in the age of prescription drugs. Okay, so the old dog (sorry Moz) hasn’t really learned a new trick. However, he changes up his style just enough on Years to make you realize that maybe he doesn’t have to. This is probably Morrissey’s loudest album to date. At age 49, The Pope of Mope gives us a real rock album. And it’s a welcome addition to an already stunning catalogue. Morrissey’s band, The Tormentors, are in full strength here. Boz’s guitar faintly mirrors some Smiths/Viva Hate era songwriting on songs like (personal favorite) “Mama Lay Softly on the Riverbed” and “All You Need is Me,” while the rest of the band provides enough sonics and energy to match. He’s had a pretty good run in the new millennia thus far, but every one of those albums has a song or two that are just……there. This is no different with Years. The guilty parties here are “You Were Good in Your Time,” and, depending on the day it seems, “Sorry Doesn’t Help.” His voice goes a little flat on “You Were Good…” and both songs really feel like fillers: unnecessary and unwanted. That said, the song immediately following those two (the album’s closer), is the probably the strongest Morrissey cut in a decade. That’s right, “I’m OK By Myself” kicks copious amounts of arse. Moz’s voice is playful, angry, and unobtainable. It’s a perfect storm that already leaves me dreaming about his next album. While this album may not convert anyone who doesn’t already adore the benevolent Suedehead, it does reaffirm why we need him around still. The dreamy underwater chug of Merriweather‘s opening track “In the Flowers” isn’t an altogether surprising first offer from a band like Animal Collective. It wallows around for a few minutes, floating on Avey Tare’s gargled vocal maneuvering throughout a wash of drone and electronics, setting a tone not unfamiliar to the Collective’s prior releases, before erupting into an anthematic fight song and settling back into the fringes of arpegiated obscurity. That is typically how the band has operated in the past: exploring the outer realms of pop music and then working their way to or around its sugary core, and then back out again. This, I think, it a very central element to Animal Collective’s approach to music in general. Many of the reviews currently bludgeoning the internet have a lot to say about the album’s directness, a conversation that really began to happen a lot more frequently with 2007’s Strawberry Jam. Like that album, Merriweather‘s most memorable moments are when the album is at its most uncompromisingly immediate. This is because the band have shown us for years that they are capable of rewarding abstraction, of mastering drone and noise and tinkering with the lines of “listenability.” The band did what it had to do, which is show their listeners that — when it comes to pop music — they don’t always have to work from the outside in. Even the band’s meteoric career shows this ethos at work, as the last five years have found them moving further and further from the left field of indie rock’s more “challenging” acts (see 2003’s Here Comes the Indian) and closer to something that sounds unquestionably human. That’s not to say that Animal Collective have lost the imagination and confidence to challenge an audience, nor that this is simply a case of a band sacrificing experimentation for accessibility; instead, the band’s embrace of the immediate can be more comfortably read as an altogether new medium in which the band can be challenging. Take the dewy croon of “Bluish,” for example: here, the band have taken their previous reaches to the outer limits of definability — be it of subject, speaker or sound — and re-contextualized them within a very direct love song. “Put on that dress that I like / it makes me so crazy, though I can’t say why / keep on your stockings for a while / there’s some kind of magic in the way you’re lying there.” Here, we not only find the album at its most earnest and unflinchingly unironic, we’re also afforded — through the endlessly busy noise components which occupy all of the song’s negative space — a glimpse of what makes this album so interesting. Instead of trying to answer the question of how to find order in disorientation, the song poses an entirely different question of how to create threads of chaos in a conventional order. In other words, what space for creative movement does traditional “pop” music provide us? The answer, according to Animal Collective: quite a lot. Blog-friendly “Brothersport,” for example, gets all of its mileage from three clearly-defined movements: the first is the almost punishing repetition of two impossibly catchy hooks, followed by two minutes of hypnotic noise and piercing arpegiators, then back to the trance-inducing sugar rush of its closing minutes. Here we have what our conditioned ear tells us are two separate poles, noise and melody, essentially providing the same service and receiving equal amounts of stage time, suggesting that the two aren’t as far apart (or easily identified) as one might think. After my first few days with this record, I likened my experience to lying on the couch and eating from a utility-sized can of frosting for two days. I felt almost guilty. Bloated with the shameless pleasure of gluttonous consumption, I knew the evidence was smudged on the corners of my mouth in sugary smears. Chris Piercy, whose analogy is unquestionably stronger, describes his time with Merriweather Post Pavilion as eating Fruitie Pebbles in a fever dream. This describes the experience more accurately in that the album’s pleasures are never simple ones. There’s something disorienting even in the band’s most direct sensibilities. More importantly, Animal Collective have proven that even the simplest of elements, like a love song or the catharsis of tragedy, have labrynthine dimensions through which we must maneuver in order to find the Ding an sich, the Thing in itself. Akin to Play Theory, especially as defined in the literary tradition, Merriweather Post Pavilion finds more reward in the continuation of play rather the than winning of the game. If it’s the hunt they’re after, then let it continue. 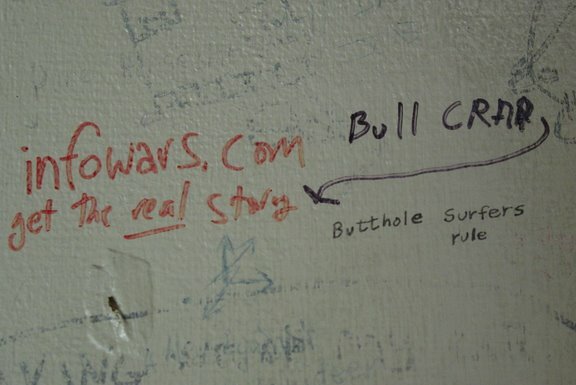 This is so totally lifted from Sarah’s bathroom wall detective portfolio. The line of thought followed between these wall artists is like so smart. “I have never been interested in painterliness,” Kelly has said, using painterliness to mean “a very personal handwriting, putting marks on a canvas.” There is no personal handwriting, nor even any marks as such, in Colors for a Large Wall, which comprises sixty–four abutting canvases, each the same size (a fraction under a foot square) and each painted a single color. Not even the colors themselves, or their position in relation to each other, could be called personal; Kelly derived them from commercial colored papers, and their sequence is arbitrary. Believing that “the work of an ordinary bricklayer is more valid than the artwork of all but a very few artists,” he fused methodical procedure and a kind of apollonian detachment into a compositional principle. 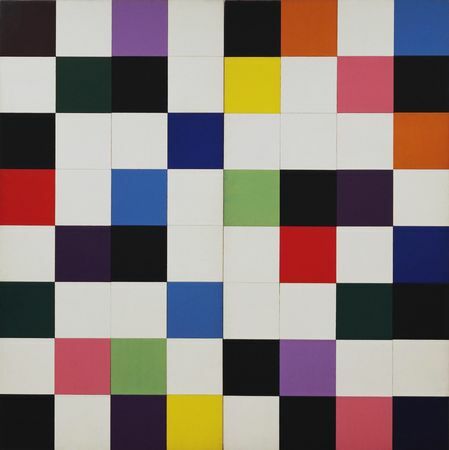 Currently on display at the MoMA is an exhibition by the American painter and sculptor Ellsworth Kelly. Kelly’s minimalist use of color and line seems almost antiquated in today’s culture of mental oversaturation. This style of painting was in many ways a reaction to the chaotic carnage splattered across the canvases of much abstract art. Clean lines, geometric perfection and colors picked at random seemed radical because they swam against the current of modern Westernized life. However, since Kelly did much of his most important work during the 1950s, his art can also be seen as a sort of austere, cool, detached commentary on the surface perfection portrayed in American domestic life.